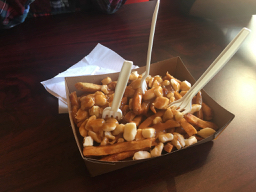 After a wonderful dinner at a Japanese restaurant, RyanC mentioned that there was a poutine place on the way back to the hotel that had good reviews. We stopped there in spite of also having an invitation to the house my cousin was renting for dessert. Since my niece and nephew had never had poutine before, this seemed like a good introduction. Fries with gravy and cheese curds. Another relative mentioned that the gravy needs to be made with duck fat but this place said vegetarian gravy so, apparently, not authentic. BTW, this is the first post in quite a while done from the laptop instead of BlogTouch Pro on the iPhone. That’s why the pictures are “clickable”. This morning, the reunion activity was a visit to Capilano Suspension Bridge. There was quite the crowd there with a Disney style line to go across the bridge. 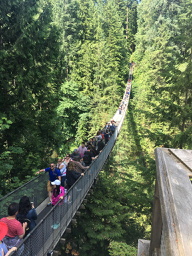 Lots of swaying but it was pretty cool as people kept moving and only occasionally would stop and try and take selfies while trying to keep their balance. It was kind of like walking on a boat. On the other side of the bridge there were a couple of walks. This is the treetop walk. 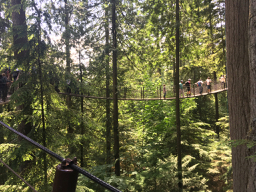 A series of suspension bridges between some very large trees. On the trees themselves, platforms circled the trunks. Everything looked and felt really solid. 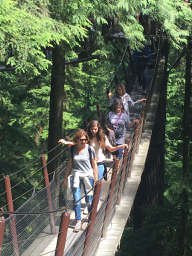 The admission to the suspension bridge area was about $48 and was included in the reunion fee. I'm sure that we had gotten some sort of group rate. I would recommend visiting here. On the parking lot side of the bridge was a cliff walk. 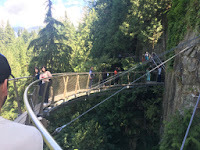 This walkway is attached to a vertical cliff around 300 ft above the bottom of the canyon. It, like all of the bridges, seemed extremely solid though very precariously perched. In the afternoon, we met at a beach for the traditional family picture. They arranged for a food truck to come in for dinner with the very non-PC name of Japadog. 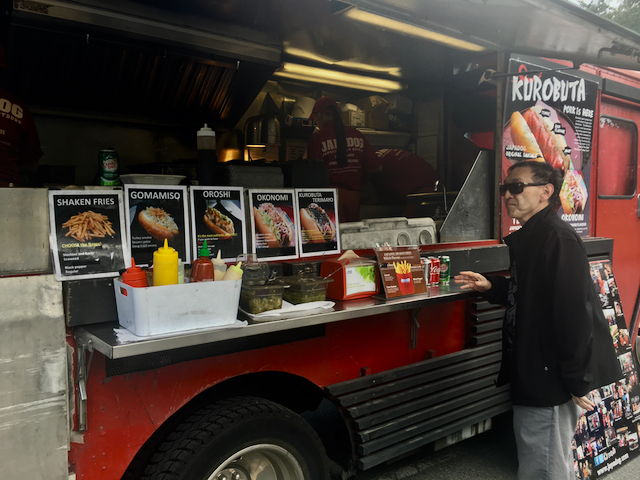 A Japanese, family-owned business that served Japanese flavored hot dogs and french fries. Things like okinomi dogs with fried cabbage, Japanese mayo, okonomiyaki sauce and bonito flakes. And seaweed flavored fries. Dessert was either black sesame or green tea ice cream served with deep-fried hot dog buns. All very delicious! After dinner, they finished off the day with some competitive events such as building an aluminum foil boat and straw and popsicle stick towers. Or the very odd 100 piece puzzle race. Veggie Poutine... works for me! Hmmm, don’t know what happened to the pictures. They did a great job. This was the next generation planning it. 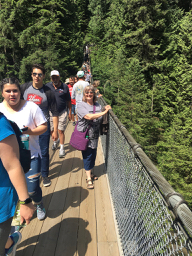 We enjoyed our day at Capilano too but the crowds were hard to take. Ashamed to admit that we didn't get to try poutine. Best meal we had was a Malaysian one in the gay quarter - absolutely outstanding. That’s where we found both the Japanese restaurant and the poutine eatery. You should hire out your reunion planner...what a cool itinerary! I have got to try poutine and will have to visit Capilano next time in Vancouver, despite the crowds. The reunion planner is now an associate professor at a California university. That's quite an exciting adventure for a family reunion! The family reunions are always an adventure!